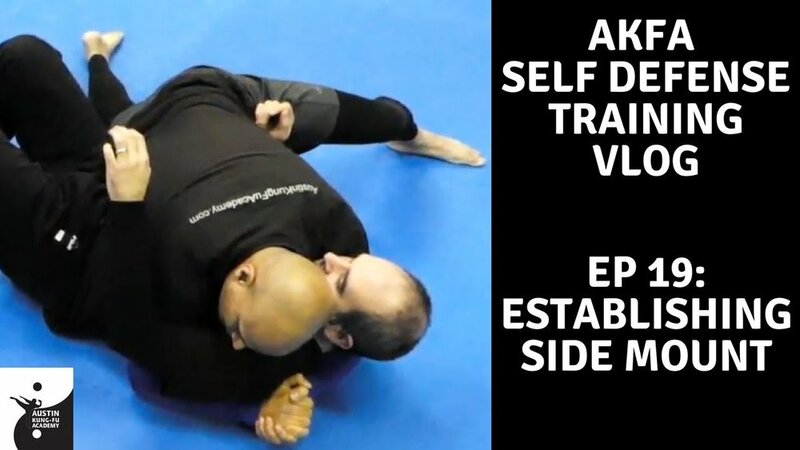 This is all about getting into side mount, also known as side control. Here we cover some nuances on how to make this a very strong controlling position. We just knocked them down with Double Ankle Sweep. Now we want to control the fight and make sure they are not going to get up and start attacking us. So to that end, we run to the side of them, as they start to sit up, we push down on their chest like a push up, lower ourselves down chest to chest, have our left arm under their neck and right arm under their arm, with our hands clasped together (this is if we've run to the left). We want to make sure our legs are spread, with our right foot's top flat down against the ground. This helps establish a very heavy hip pressure on them. Our left foot is posted, with the bottom of the foot flat against the ground, knee bent. Be sure to turn your head away from them to minimize the chance of their hand coming to your face (but if it does happen, we do have a defense against that). This is a major position in ground fighting. Get this position down solid. Newer PostHow to Keep the Side Mount - Roll Prevention!